Michele and her bull-catching compatriots in action, sleeping out in swags alongside their beloved (and impressively bull-barred) Wildfire. You read that right: catching bulls in Cape York… Michele Maddison takes us along on the ride of her life. Tranquillity. As you pry your eyes open, lying in your swag by the river, sunbeams filter through the trees and birds join in the early morning choir. Swat – go away fly, you’re destroying my oasis of peace. Suddenly over the embankment comes the roar of the Landy engine, oasis gone. It was time to get up and embark on a day of outback adventure… bull-catching. How do you catch a bull? Now, for a greenhorn like myself, I couldn’t even begin to imagine what this entailed. I thought riding around in a Landy (affectionately named Wildfire) looking like something off a Mad Max film set couldn’t be too hard. I mean, there’s no doors, a missing windshield, a huge V-shaped object protruding out front (that’s one heck of a bull bar) and no padding on the metal seats – but lucky I have extra city-slicker padding of my own. One of the shrinking waterholes spotted on Michelle’s trip during the dry season. 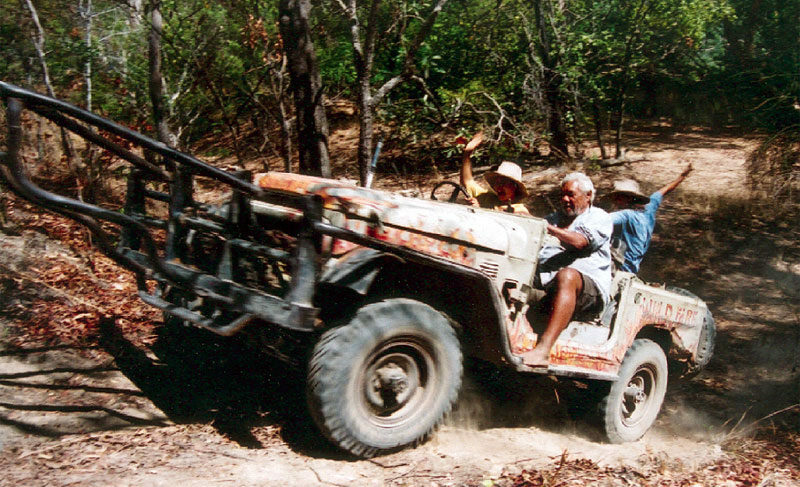 We’re on Southwell Station, 200km from Pormpuraaw on Cape York, accessible by 4WD and light aircraft only. We’re cruising along the tracks of the 200km2 station, not another soul in sight. It’s the dry season, shrinking watering holes pass by, giant termite mounts, dry grasslands, crisp Australian bushlands, and did I mention the dust? Apart from admiring the raw beauty of the bush we had to keep an eye out for the elusive bull. Who, I might add, hasn’t seen humans before. Basically, the whole Wildfire, with us in it, could be swallowed up and we get to meet the Hobbit in Middle Earth. Okay, slight exaggeration, but you get my meaning. This is slightly hindered by the bush sometimes covering these so called breakaways. The fact that Wildfire is ploughing through, at speed, to get to the bull the quickest way possible has my knuckles white on the bar in front of me. If I had hackles, they’d be standing on end. My heart is pumping but there’s a huge smile on my face. I must be mad. Wildfire and bull start to count in on the bush tango: 1, 2, 3, 4… we go straight, to the left, straight, to the right, left, right, straight, left again at a cruising altitude from ground zero to about 60km/h, knuckles getting whiter. 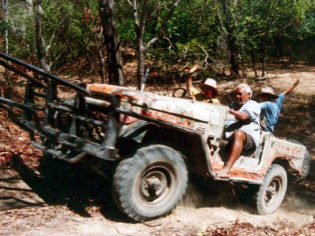 Our adrenalin levels rise as we get closer, then someone yells; “Watch out for that tree!” Oh, right, so that’s the reason the big bull bar is at the front, so we can go through those. “Mmm, I believe that was a eucalyptus,” I think as I spit leaves from my mouth. I was getting a little hungry anyways. After the excitement of eating eucalyptus, we’ve momentarily lost the bull, but he’s soon spotted again and I actually think he’s grinning. He got away with that one. However, we don’t give up that easy. It was time for the waltz to get him. This love affair was over, and we meant business. Round, around and around again we go. Suddenly both parties halt. Wildfire and bull stare off. Greenhorns get reminded that if the bull goes for you, don’t jump on the lap of the driver, dive for the back. Now I’m eyeballing those huge horns and I realise why my husband decided to stay camp-side. Mental note for next time. The dance resumes, and we catch our partner by surprise and Wildfire has the bull. Everything happens so fast, the next thing we know the brave ones are back in the car, bull tied to the tree awaiting collection by the tractor and trailer that follows later. The catch for the day is loaded onto the trailer. We pick up Grandpa, who’s made us a lovely billy tea while waiting for us to finish the dance. I think my heart is still running over the legal limit but feel so alive, I can’t wait to do it again. We finish our tea then head off to spot more bulls. We proceed to find another 12, not a bad catch for the day. Hours later we pull up outside the homestead and recap our remarkable day. No feeling in my extra city-slicker padding? Check. More Australian bush in my hair, down my polo shirt than I care to mention? Check. New hair colour – dust beige, when pat on head like talc powder escaping? Check. A huge smile you can’t wipe off my face? Double check. Michelle based herself at Southwell Station. I may have started out the greenhorn but left with a brand new respect for the people who live on the stations in the Cape York. Would I do it again? In a heartbeat!